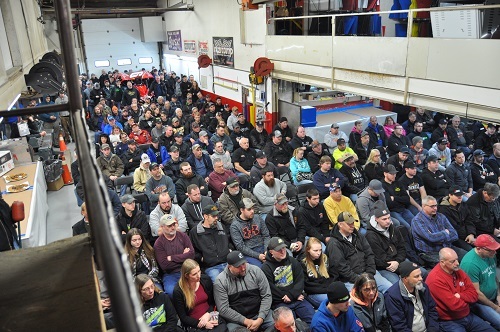 This past Saturday customers from all over Ontario and the United States were in attendance for Bicknell Racing Products annual Open House. Over 300 people packed the factory location in St.Catharines Ontario to take in the free seminars offered throughout the day. Many people in attendance also took advantage of the sales happening at both of the retail locations in St.Catharines and Niagara Falls NY. A panel Q&A seminar was part of the morning program which saw Kevin Root (and his son Nicholas),Matt Sheppard and Randy Kisacky speak, as well as Pete Bicknell and Bob Slack from Bicknell Racing Products, and Brian Daugherty from Integra. “The Q&A is always successful”, explains Bob Slack- part of the ownership team at Bicknell Racing Products. “It was great to see the room full of people. Everyone had a chance to have their questions answered and hopefully learned a little bit along the way”. After a break for lunch it was right into the afternoon session and some deep discussion on the new Fire Suppression Systems. With so many different types on the market, and a lot of people not knowing which one is best suited for their application, it was important for Bicknell to address this with their customers. “We had experienced an overwhelming amount of questions and concerns from customers leading up to the open house”, explains Erica Bicknell-Jones. Part of the management team at Bicknell Racing Products. “We felt that it was necessary for us to dedicate part of the open house seminars to discussing the fire suppression systems, and it was important to have cars on display that the systems were mounted in so customers could have a first-hand look”. After the seminars were complete, a number of prize draws took place including the giveaway of a new chassis. Congratulations to everyone that won! Bicknell Racing Products would like to thank Kevin Root, Matt Sheppard, Randy Kisacky and Brian Daugherty for speaking at the morning seminar, and special thank-you to all the customers that were able to attend. The day was a huge success!